This week, I stumbled onto a guys’ fashion trend I’d somehow missed until now. Visiting a friend at his office, I discovered that – newsflash – when it comes to suits, polar fleece is the new wool. My friend does…something with money. A hedge fund maybe? Investment banking? Let’s just go with “finance.” As my knowledge about this world comes entirely from the movie Boiler Room, I expected to find the office full of testosterone-fueled guys racing around in pinstripe suits, suspenders and slicked-back hair, screaming “Buy!” and “Sell!” at random intervals. Walking in, I was disappointed to find his co-workers moving at regular speed and speaking in indoor voices. Instead of flashy three-piece suits, most of the guys were sporting suit pants, dress shirts….and fleece jackets or vests. The look has the overall effect of a reverse body mullet – business on bottom, party up top. That is, if the party was hosted by Patagonia and refreshments were trail mix and coconut water served out of Nalgene bottles. “It’s the new sweater vest,” a friend told me of the fleece as a suit coat replacement. The Mr. Rogers-style top swap simply reinforces for me how silly the idea of dress codes are in the first place. 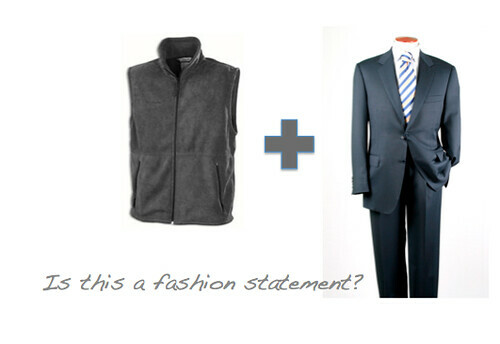 Guys sporting fleece vests and jackets at work are clearly inching towards activewear, one layer at a time. And I can’t say I blame them; who doesn’t want to feel more comfortable at work? It’s the same reason we get ergonomic chairs and gel shoe inserts. But why float the rules? Why not change them? Don’t get me wrong. I’m all for a suit when it *ahem* suits the occasion. Big client presentation? Suit up! Wedding day? Go all out! But every day? What’s the point? Do I think my friend and his co-workers could achieve their work objectives wearing smartly-cut khakis and a nice shawl-collared sweater? You bet. The emperor may be wearing clothes, but they’re made of insulating synthetic fibers, and it’s time someone said so.